Resistance is 'the act of fighting against something that is attacking you, or refusing to accept something (Cambridge Dictionary, 2017)." Our history books are riddled with heroic tales of resistance to foreign invaders. From the Greek resistance to the Persian invasion in the 5th century BC to the more recent Aboriginal resistance, led by Pemulwuy, to British occupation of their territory around Sydney, NSW, in 1797; and from the American resistance to the British Empire in the Revolutionary War to the French Resistance against German occupation during WWII. These brave acts of defiance bring with them stories of individual gallantry and heroism against overwhelming odds. One such hero was French Resistance fighter, Henri Honoré d'Estienne d'Orves. 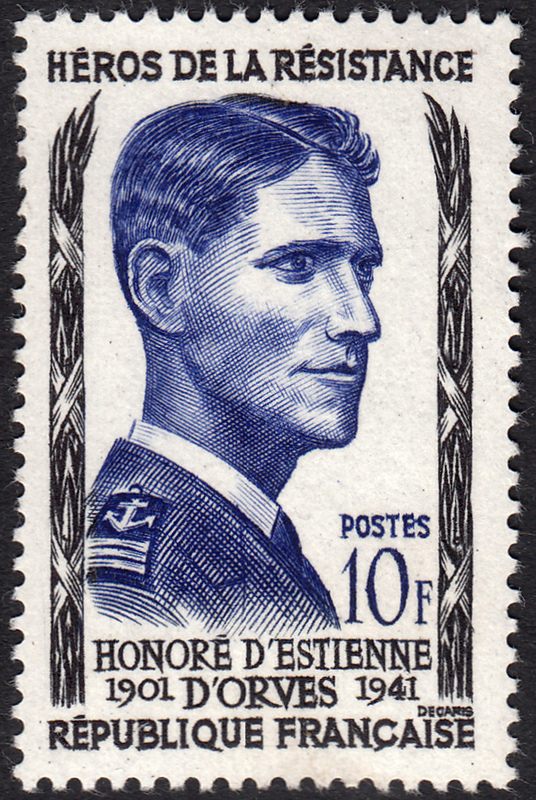 D'Estienne d'Orves, born 3 June 1901, was educated in some of the finest schools in Paris before joining the École Navale, (French Naval Academy) in 1923, where he was stationed on the training ship Jeanne d'Arc. Life in the Navy seemed to have agreed with d'Estienne d'Orves, and he quickly rose through the ranks. By the time World War II erupted in 1939 he was the under-chief of the headquarters of the 2nd flotilla of torpedo boats in Mediterranean Sea, and by December of that year he became an aide to Admiral Godfroy in the Headquarters of "Force X". On 25 June 1940, an armistice was signed between France, led by Marshal Philippe Petain, and Germany, allowing German forces to occupy France. Unsurprisingly, not all of France was happy with this scenario. Many, such as General Charles de Gaulle, considered this tantamount to surrendering in defeat. Having fled into exile to London, de Gaulle spearheaded the "Free France" movement. Unwilling to accept the armistice like so many others (including de Gaulle), D'Estienne d'Orves sailed from Africa to London aboard a cargo ship. On 27 September 1940 he met with Charles de Gaulle. Unable to obtain a sea command at this time, d'Estienne d'Orves was given a different mission by de Gaulle. On 15 December 1940, he was tasked with organising an intelligence network in western France, code-named "Nemrod". Code-named "Jean-Pierre Girard", d'Estienne d'Orves set up his intelligence network headquarters in Chantenay-sur-Loire, near Nantes along with his radio operator, Alfred Gaessler, a 20 year old German-speaking Alsatian, with the code-name, "Georges Marty". Over the next several months, d'Estienne d'Orves created an efficient spying web, allowing him to gather intelligence pertaining to German military movements. Unfortunately, it turns out that d'Estienne d'Orves' radio officer, Gaessler, happened to be a double agent, informing the Nazis of the movements of d'Estienne d'Orves. On a trip to London, d'Estienne d'Orves was cornered by the Gestapo. But d'Estienne d'Orves didn't go easily. He and his companions put up a strong fight. Eventually, however, the Gestapo captured and arrested him. D'Estienne d'Orves was wounded in the fight. Thankfully, the spy web he had created remained undiscovered and continued to operate right up to the Liberation of Paris in August 1944. "Sir, you are a German officer. I am a French officer. We both served our duty. Please allow me to hug you (Wikipedia)." At dawn on 29 August 1941, Henri Honoré d'Estienne d'Orves was executed by firing squad at Fort du Mont Valérien, France. But this man's heroism was most assuredly not forgotten. He was posthumously promoted to Capitaine de frégate (Commander) and made a Compagnon de la Libération (Fellow of the Liberation). And inspired by his martyrdom, many people joined the ranks of the French Resistance. On 20 May 1957, France issued a set of five stamps honouring the Heroes of the Resistance. The 10f value depicting Henri Honoré d'Estienne d'Orves was designed and engraved by Albert Decaris. The portrait is a fitting testimonial to the courage, loyalty, and honour of Henri Honoré d'Estienne d'Orves. A true hero!